In the first article of this series, we learned what query parsing is and what impact it has on query performance. In this part of the series, we shall continue the discussion and look at Soft Parsing of the query. As we saw in the previous installment, a query has to undergo Hard Parsing at least once. It’s important because only after hard parsing first occurs can we expect to find the cursor in memory. Once it’s in memory, the cursor can be reused for the execution of the query as shown below. 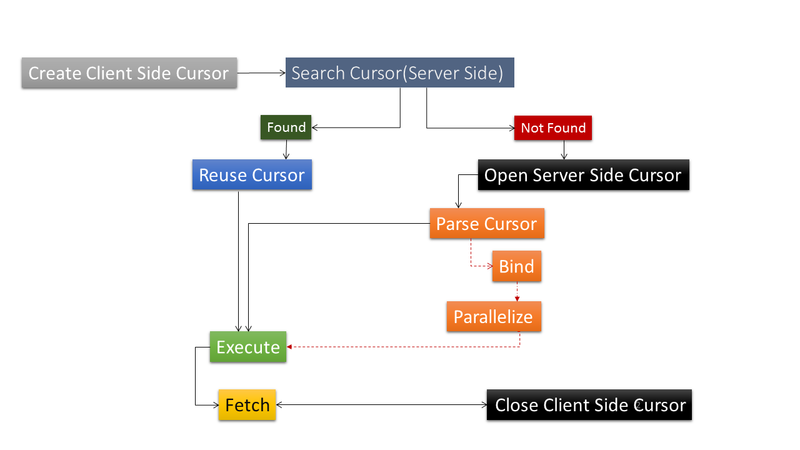 This process of finding the cursor in the memory (Shared Pool) is called Soft Parsing. Soft parsing happens when the two subsequently-executed statements are deemed identical by the query optimizer. It’s important to note that the statements must not just be identical but shareable as well. Here is a simple example to demonstrate this. What we will do is to execute a very simple query, first in lower case and then in upper case. This is exactly same query, the only difference being the sentence case. Let’s see how Oracle treats it. So as expected, the result is exactly the same (no surprise there). Oracle treats the queries as identical. But are they also shareable? Let’s find out by looking into two views: V$SQLAREA, V$SQL. This first result is from V$SQLAREA. Before we explain the output, let’s look at the V$SQL view as well. So what do we see here? It’s quite clear that both queries choose to use the same execution plan (they have the same PLAN_HASH_VALUE). This is understandable as both of them are supposed to only use full table scan, which we can see if we view the execution plan. But despite this similarity (both queries being identical), there are certain differences which mean that these two queries are not sharable. For example, you can see that both queries create two different SQL IDs. Also, both queries are loaded independently (LOADED_VERSIONS is 1 for both) and both have an individual “child cursor created” for them. So, despite the fact that the two statements were identical, Oracle didn’t consider them as sharable. Where this is the case, both of the statements are executed as standalone statements. As we discussed in the previous part of this series, this means both the queries would be Hard Parsed. When it’s not possible for a server process to find a matching cursor from the Shared Pool (Library Cache (LC) in particular), or if the cursor that’s present in the LC is not sharable, Oracle will decide that the cursor has to be created (or re-created). In other words, the statement needs to be compiled, and this mechanism is called Hard Parsing. The decision between hard or soft parsing is based on whether, for a given statement, a matching parent and an executable and sharable Child cursor is found or not. At this point, you must be wondering what the terms “parent/child cursor” mean. Good that you asked – it’s what we will be looking at next. But before we proceed, it’s important to know a little about the memory structure where these Parent and Child cursors reside – the Library Cache. So let’s look at Library Cache, from a distance. Before we can get to the discussion of the parent and child cursors, we must understand where they reside in the System Global Area (SGA). SGA is a cumulative term and contains numerous shared memory structures inside it, i.e. Data Buffer Cache, Shared Pool, Large Pool etc. Of these, probably the most important memory structure is the Shared Pool. Though SGA contains many sub-structures inside, one of the most important and most-used is the Library Cache.LC is the overarching structure which contains different types of objects inside it. The category of such objects is Namespace, and it’s exposed in the public view of V$LIBRARYCACHE’s NAMESPACE column. The following output is taken from an unpatched 12102 database running over EL 6.5. Of the above categories, the most highly-used is SQLAREA. Each category represents the objects which are loaded in the LC known as Library Objects (LO). LOs for the SQLAREA namespace are SQL statements which we upload when we execute a query. Now Parent and Child cursors come into the picture. A query is represented in the library cache in the form of a shared cursor. This shared cursor is further categorized into two distinct types – Parent & Child cursors. Though both cursor types are important, it’s the child cursor in the library cache which governs the decision over whether a query will undergo a hard parse or a soft parse. If a query will undergo soft-parsing, then a matching child cursor for that query must be found – and not just found, the cursor must be identical and sharable. Of course, as we have seen in the example given above, the statement that we are currently executing is identical to the one we have executed before. But it might not be a sharable statement and if that’s the case, we have to reoptimize it. If in this case you are confused by the word “cursor”, it is the memory area that represents the statement. A Parent cursor is essentially created for every query that’s uploaded in the LC You can say that this form of the cursor (or query) is like a wrapper or a template given to the statement. But just like a wrapper, it might not contain the same ingredients inside. The parent cursors are located in the LC using the Library Cache latch and the parent cursors are represented in the view V$SQLAREA. If we look at the example statement that we saw before, we have two separate or distinct Parent cursors in the LC. But a parent cursor has to execute as well. And that’s where the concept of Child Cursor comes into play. A child cursor represents a particular form or type of parent cursor. In other words, a child cursor represents what will finally be executed. Since every child cursor must belong to a parent, thus every parent would execute with at least one child cursor created for it. Several forms of the parent cursor may exist in the Library Cache. Let’s see an example of the situation where a query is will have a single parent cursor but the child cursors are not shared. For this example, we will alter the settings of the optimizer mode used in the execution of the query. We start by flushing the Shared Pool and then move on to alter the OPTIMIZER_MODE parameter to FIRST_ROWS (the default value is ALL_ROWS). Now, let’s alter the parameter again to a different mode. It’s clearly visible here that the optimizer mismatch was the reason for the new child cursor being created. 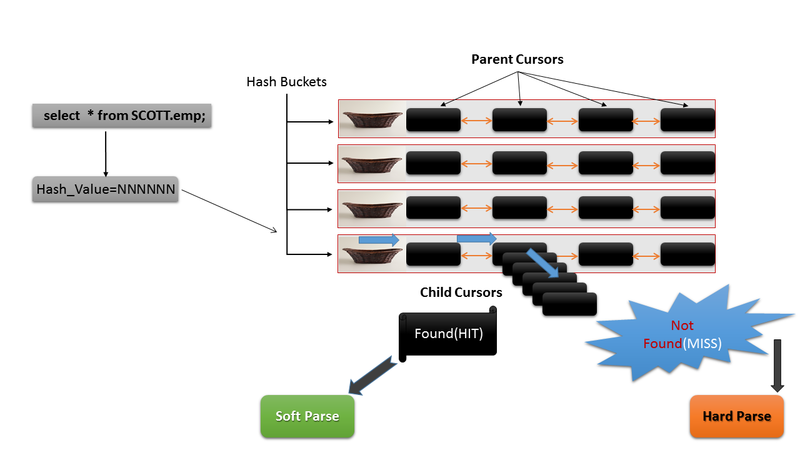 Understanding the parent and child cursor concept is of paramount importance in order to have a clear picture of the Hard Parsing concept. In the next part of the series, we will look at the concept of the No-Parsing! Stay tuned!